There are a number of stakeholders involved in designing the water-related aspects of a new development, with the Planning Authority, Local Sustainable Drainage System (SuDS) Adoption Board, designers and their civils specialists all needing to reach a consensus. It is helpful, too, if the client understands the technical issues facing their team, shares a vision how the project will benefit from its water-related amenities and how these will be maintained throughout the working life of the project. The end-result needs to be compliance with the requirements of the 2010 Flood & Water Management Act, and with the incoming new SuDS Standard. Cost-effective SuDS Adoption is also a new vital consideration. National regulations, standards and procedures reflect future needs, which in the case of water is not promising. 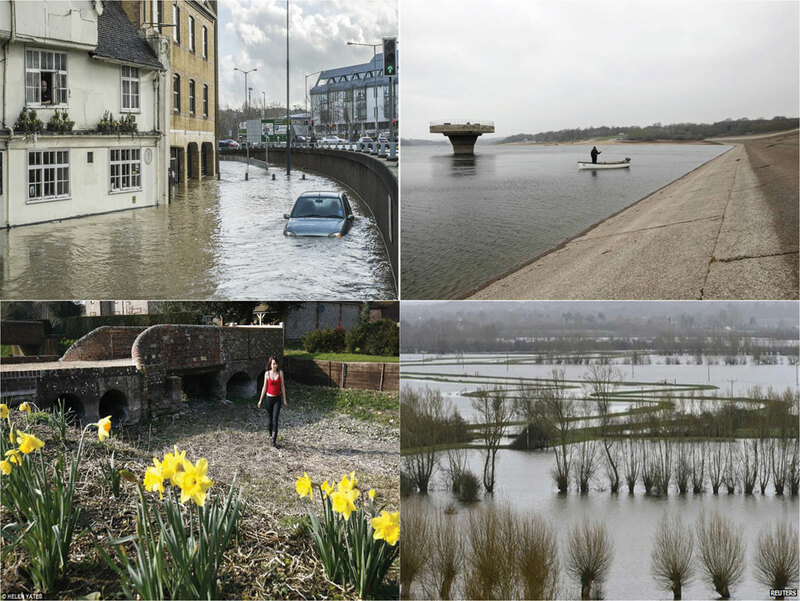 According to the 2010 Environment Agency Report Water for People and the Environment, the current stresses on water supplies will be exacerbated by anticipated population growth. 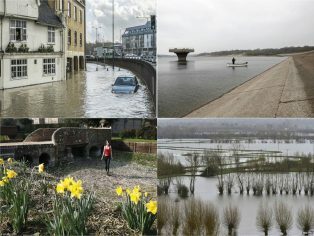 Climate change is also predicted to alter weather patterns, leading to future prolonged dry spells broken by intense downpours. This pattern of rain will lead to more frequent droughts and floods, most recently illustrated by a severe and widespread drought in 2012, and this year’s floods. Self-evidently, the surplus of rainfall that might lead to floods needs to be managed in ways that will serve also to alleviate droughts. On new developments, the most straightforward way of doing this is to extend the SuDS principle of managing rainfall at the point it falls (source control), so that the water is made available for reuse for non-potable purposes, rather than simply being attenuated. Taking this design approach from the outset on a new project substantially affects the capital and life cycle costs, compared to stand alone SuDS and water reuse solutions, particularly when adoption charges are taken into account. A 2010 government-funded Developer Guidelines Study provides a good example of how this principle can be applied in practice. In the housing development example illustrated, every attempt is made to source control surface water at the level of individual properties, using features such as soakaways (where effective), permeable paving and a rain garden. Adding a rainwater harvesting (RWH) system to this mix plays a substantial role in limiting run-off by dealing with all the roof water. Even so, the holding tank for the system does need to overflow during exceptional rainfall events. This overflow can be used to supplement the water available to a communal system serving several smaller properties, whose roof size does not justify an individual system. The communal holding tank will also need to overflow into a SuDS, which ideally should comprise a surface balancing pond and/or swale(s). A water management train along these lines would usually be designed to reduce mains water consumption by around 40 per cent below the level provided by water efficiency measures alone, thus addressing the risk of future droughts. It will also account for a substantial proportion of the water that needs to be SuDS managed, reducing the scale of any additional attenuation required. As the RWH systems form part of the household water supplies, they will need their own maintenance regime, and by their nature will assist in meeting the water quality aspects of the 2010 Flood and Water Management Act. In simple terms, the SuDS aspect of the water management for all roof water needs only start from the overflow outlets of the communal tank(s), which can also contain an attenuation volume if required. This substantially reduces the complexity and cost of adoption, particularly when easily maintained balancing ponds and/or swales form the remaining part of the overall surface water management train. 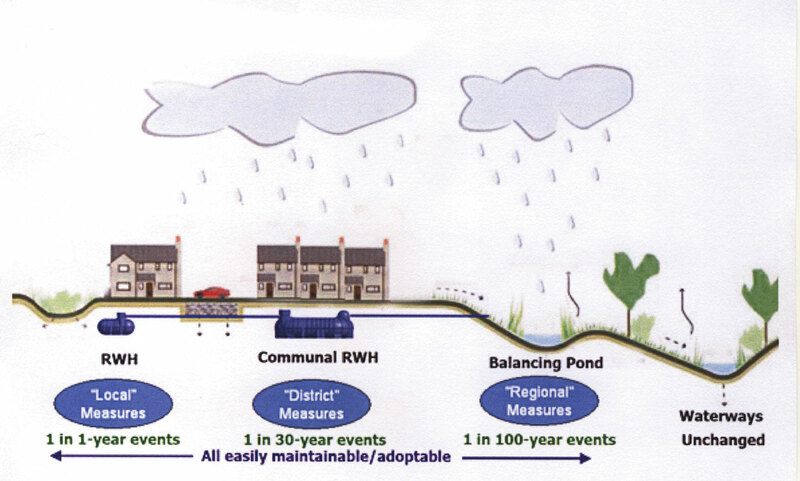 Carefully designed, integrated RWH/SuDS systems along these lines address both the floods and droughts aspects of the Environment Agency’s climate change predictions, at no greater cost than a stand-alone SuDS when adoption costs are taken into account. An important key, however, is that all stakeholders start by sharing the same concept for the water-related aspects of a development, a concept which it would be most helpful if the government could share and encourage as a matter of policy. For further information see www.ukrha.org or join the debate @harnessingrainwater #reusewater on Twitter.